This Leh motorcycle trip odyssey takes you from the lush valleys of Manali into the heart of one of the most starkly beautiful regions of India, and back to Manali. You'll be riding to iconic landmarks like Pangong Lake, Sarchu, and Nubra Valley, thundering through high altitude mountain passes, visiting monasteries, camping under Ladakhi skies, and making memories that will last you a lifetime. PRICE VARIATION: Price displayed for the trip is for 2 people per bike (1 rider and 1 pillion rider). NOTE: There is an additional refundable deposit of INR 10,000 per bike to be paid before the start of the Manali-Leh motorbiking trip. Your Manali-Leh-Manali motorbiking adventure starts in the small centre of Leh, where you'll have a day to get used to the altitude. After that, you'll set off to Jispa, and onwards to Sarchu. You'll ride through the high altitude pass of Khardung La, and visit the cold desert of Nubra Valley, where you'll see sand dunes and double-humped camels. After that, you'll head to the blue-green Pangong Lake, and spend a night there, before returning to Leh, and then back to Manali. At the end of this trip, these roads will be a part of you forever. 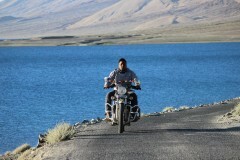 • Roar through the Leh landscape on a powerful Royal Enfield. 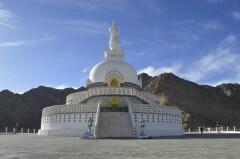 • Visit Ladakhi landmarks like Nubra Valley, Pangong Lake, and Khardung La. 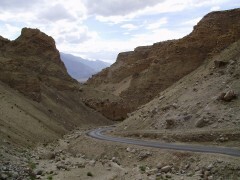 • Travel across Ladakh from the green valleys of Manali to stark landscapes of Leh. • Spend the night in tents on the banks of Pangong Lake. • Sleep in the cold desert of the Nubra Valley. During the Manali-Leh motorbiking trip, you must wear a helmet at all times. You will also be required to carry your ID at all times. Any damage of the bike/helmet during the Manali-Leh bike trip will have to be paid for by the guest. Before starting the Leh motorbiking trip, all riders and pillion riders have to sign an Indemnity form. Participants who leave the group mid-way (for medical/health or other reasons) will have to pay for any additional costs and for transporting the bike back to Manali-Leh. Compensation for any damage/accident done by you during the Leh motorbiking trip to others' property/person would be directly payable by you. All guests will be responsible for safety and security of their own luggage. For cancellations made 45 days or more before the departure of the Leh motorbiking trip: 75% of the trip fees will be refunded, minus any transaction charges. For cancellations made 30-44 days before the departure of the Leh motorbiking trip: 50% of the trip fees will be refunded, minus any transaction charges. For cancellations made 0-29 days before the departure of the Leh motorbiking trip: No refund. No refunds for late arrival or no show. The operator reserves the right to change the dates of departure of the Manali-Leh motorbiking trip if it is deemed unsafe. The operator will not be held responsible for any change in itinerary of the Manali-Leh motorbiking ride due to reasons beyond control, like change in flight and train schedule, cancellation of flights/trains, political disturbances, natural phenomenon, etc. The operator or any of its service providers does not cover for any kind of insurance and will not be liable in any case for any mishap/loss etc. The operator has the right to cancel the group if a minimum of 4 bookings is not confirmed. Any meals/services not availed of by the traveller are not refundable. Today you'll arrive in Kullu and will check in to your campsite. You'll be given your bikes today, and can go for a short ride to get used to them. The day is free for you to meet the other members of your biker gang, and get used to the altitude. If you need to buy any last minute essentials, today is a good day. Overnight in campsite on twin or triple sharing basis. After a hearty breakfast, you'll begin your first day of riding. You'll ride on the Manali-Leh highway, towards Jispa. The first check point for the day is Rohtang Pass, at an altitude of 13,047 feet. At Jispa, you will stay in a hotel on triple sharing basis. After a hearty breakfast, you'll hit the road again. Today you'll go thorugh Baralacha La, a pass located at an incredible 16,000 feet, and into Sarchu. Overnight at Sarchu in tents on triple-sharing basis. You'll start your ride towards Leh, going through Tanglang La (17,480 ft) which is the third highest motorable pass in the world. Later in the afternoon, you will cross the Indus valley and arrive at Leh. Overnight stay in hotel with attached washrooms. It's a rest day in Leh today. Over the next few days, you'll be covering long distances at high altitudes, so it is important that you are properly acclimatized. Make sure you rest, stay hydrated, and eat regular meals. In the evening, you can go for a short walk in Leh city. Overnight in your hotel in Leh. Today you'll leave Leh behind and head off into the mountains to Nubra Valley. The ride is very scenic, and you'll get to stop at Khardung La en route. Khardung La is at an elevation of 17,582 feet. You'll have some time to explore the pass and take photographs, before you head on to Nubra Valley. This cold desert is barren and dramatic, and you're sure to see the famous double-humped camels here. You'll be staying in Nubra Valley for the night, in a hotel. Overnight in twin or triple sharing rooms. It's time to put your helmets on again and ride out to Pangong Lake. This famous lake is breathtaking, with clear blue water that stretches for miles. You'll be camping in deluxe Swiss tents for the night, right on the banks of the lake. You'll get to see the sun setting over the lake, turning it all shades of purple and crimson. Overnight in tents at Pangong Lake. Today you'll say goodbye to Pangong Lake and ride back to Leh. You'll stop at Khardung La once again, and then proceed onwards to Leh. At Leh, you'll check in to your hotel for the night. Enjoy your last evening in Leh for this Manali-Leh-Manali biking trip, because tomorrow you'll begin your return to Manali. Overnight in hotel. Today you'll ride to Sarchu, and stop there for the night. 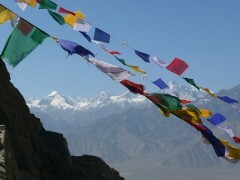 Sarchu lies at 14,000 feet and is serene and vast. You'll enjoy the peace and quiet here. You'll stay at deluxe camps for the night. Today you'll wake up, dig into breakfast, and set off on the last stretch of your Manali-Leh-Manali biking trip. You'll ride from Sarchu to Manali today. By evening, you'll check in to a campsite in Manali. You'll be returning your bikes today. Overnight in tents. Today you'll wake up, dig into breakfast, and enjoy a peaceful morning before it's time to check out. Trip ends here, leaving you free to proceed on your way. Personal expenses like extra meals or beverages, apparel etc. Costs arising out of unforeseen circumstances like landslides, road blocks, bad weather, etc. • Please carry all specific personal and prescribed medications. Arrive in Manali and spend the day at leisure. You'll be accommodated in deluxe tents in Manali. Today's meal package includes dinner only. Tonight you'll stay in a hotel, in triple sharing rooms in Jispa. Today's package includes breakfast and dinner. Tonight you'll be staying in deluxe tents with attached washrooms, on triple sharing basis. This is when you start to feel even more connected to the landscape, when you can hear all its sounds as you fall asleep. Today's package includes breakfast and dinner. You'll spend the night in a charming hotel in Leh, sharing rooms with attached washrooms. Triple sharing only. 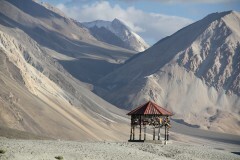 You'll be staying at a hotel or campsite in Nubra Valley. Your accommodation will be twin or triple sharing, with attached washrooms. Today's package includes breakfast and dinner. Tonight you'll spend the night beside the lake, in a deluxe tent with attached toilets, on sharing basis. Tonight you'll return to Leh and will spend the night in a hotel. Your rooms are on twin/triple sharing, and have attached washrooms. Today's package includes breakfast and dinner. Tonight you'll be staying in deluxe tents with attached washrooms, on triple sharing basis. Today's package includes breakfast and dinner. You'll spend the night in a twin or triple sharing tent with an attached washroom (no hot water, but a bucket of hot water can be arranged on request). You can spend the day enjoying the green environs of the campsite. Today's package includes breakfast and dinner. Today you'll wake up and eat a hearty breakfast. After that, it's time to check out. Trip ends here. The campsite is about 4 kms away from Kullu and 2 hours from Manali, and can be reached by road. The operator will arrange your transport to the start point.